Municipal elections are coming up. The OCCRC has asked questions to the candidates to find out their opinions about issues important to the residents of Orléans. Click on the following issues to read the Orléans ward candidates’ answers. We have not received answers from the Cumberland’s ward candidates. Again this year, we witnessed a significant increase in the use of all our first-line services. Our direct intervention programs, intake, crisis intervention and food bank, continued to be in high demand. We also noticed that more and more individuals who are faced with difficult and complex life situations require sustained and more frequent interventions from our staff. Last year, 622 individuals – 42% of which were children –, compared with 328 in 2007 and 495 in 2012, received food assistance on a monthly basis. This represents a 90% increase over ten years and a 26% increase over five years. Last year as well, we met with 899 individuals through our Intake Program and our emergency services, as opposed to 491 individuals five years ago, for an increase of 81%. In a survey conducted this year by the Social Planning Council of Ottawa among social services organizations funded by the City of Ottawa, 87% of respondents indicated that they had seen an increase in the use of their services; however, 44% of them stated that they had no choice but to scale down their services; worse, 18% of them stressed that they had to turn away a number of clients due to lack of adequate resources. a. Should you be elected, would you commit yourself to the development of a long-term vision in order to reinvest in our social infrastructures? b. Given that the population keeps growing and that the needs in the community are evolving, would you ensure that community social services as well as municipal services are allocated adequate funding to meet the ever-increasing demand for them? Absolutely. Healthy and robust social infrastructures are necessary for the well-being of our community. Our community resource centres and health centres provide essential services for our residents. I have been involved with the OCCRC for several years and I have witnessed both its positive impact on our community as well as its struggle to increase its services to answer a growing need. As councillor I will support policies that invest in our social infrastructure and I will work to increase municipal funding for these services. a. I am committed for the development of a long term vision in order to reinvest in our social infrastructures. b. I would ensure that community social services as well as municipal services are allocated adequate funding to meet the ever-increasing demand for them. a: Oui, advenant mon élection, vous pouvez compter sur mon appui entier et indéfectible afin de réinvestir dans nos infrastructures sociales. J’ai rencontré le directeur général du Centre de ressources communautaires d’Orléans-Cumberland ce mois-ci et je suis bien au fait des enjeux sociaux de la communauté d’Orléans-Cumberland. b: Oui, advenant mon élection, je réclamerai à la table du conseil municipal d’Ottawa une augmentation des fonds et subventions aux services sociaux communautaires et aux services municipaux. Orléans is a true reflection and example of the richness of Canada’s language, culture and moral principles of providing it’s least fortunate citizens with social supports to meet, at a very minimum, the basic necessities of life. It is not ok that close to 300 children in our community need daily food assistance. Poverty is a complex issue with many social factors contributing to its rising numbers. Examples such as available employment opportunities, physical disabilities, mental illness, alcohol / substance abuse issues, affordable housing, social exclusion, new Canadians, teenaged pregnancy … all contribute to unemployment and cycle of poverty. Unfortunately, it is often children who suffer the most and who are at further risk of repeating the cycle. Clearly, given the complexities, an organized and prioritized long term approach to preventing poverty in our community is urgently needed. Right now I see many good people doing great work in a system that is allowing our most at risk to fall through the cracks. Our plan needs to be responsive and reflect the needs of our community. Social programs supporting poverty reduction is the responsibility of government, but it requires a coordinated commitment from the community including, health / mental health care agencies and providers, municipal and provincial funders and other cross sectorial stakeholders. I will advocate for funding that ensures no one in our community is ever without, or turned away from, the basic necessities of life. a: Yes, I support the development of a range of programs to reinvent our social infrastructures. This would include lobbying for basic income, more affordable housing, food policies to support low income families, and more. It needs to be multi-faceted because the issues bringing people into the social programs are complex and intersectional. b: I’ll admit I am less prepared for this questions than I would like. I would like to say we need to maintain funding at x% of the city budget or $x per household. But I don’t know the current funding levels and if they are adequate. Funding needs to be linked to both population growth and inflation. a. Absolutely things need to change and social infrastructure will play a big part in bringing us all together. We need to use community benefits agreements with developers that will include social infrastructures. b. I will make certain that we have adequate funding. I really believe that all Government revenue created from the legalization of cannabis should go to social services and I will continuously fight for this. a. Yes. We are a community, and we need to take care of one another. I will work with all levels of government and with the community to promote inclusion and social wellbeing. I know that families are struggling and we need to set the conditions to bring more employment close to home while taking care of those who are not in a position to be employed. We must tackle the mental health and addictions crisis we are seeing here in Ottawa. We cannot be our best if we do not feel our best and that is why my platform seeks to ensure proper mental health support in the ward. b. I will work with you and support you. I know how important your work is and I am always so heartened to see your volunteers at great events like the Stray Dog anniversary party this weekend. You work hard to serve our community and I will work hard to support you. a : Yes, and I will also encourage local community associations to join hands in the long-term vision to reinvest in our social infrastructure that way our community can benefit. b : I am a firm believer of teamwork and I will always be available to work alongside with the community associations. a. Yes, I would commit myself to the development of a long-term vision to reinvest in social infrastructures. This commit in itself, of course, is rather meaningless unless it is coupled with a long-term funding commitment. I believe that this initiative would best work by having tri-level government cooperation. Each level of government has normally indicated in repeated budget and platform announcements that they will improve the lot of those in need, however we rarely see any tangible improvement, as the stats you note clearly indicate. Each level of government has its budget restraints, so perhaps some consolidated efforts to follow through on Priority items and specific goals. I believe concepts such as Inclusionary Housing , Expansion of access to Community Centers and resources, effective and affordable child care are among the key points to enhance Social infrastructure. So, the answer is yes I would commit myself to its promotion. b. It’s a complex issue as the population grows, however perhaps a model that ties funding to a per capita formula can at least keep the funding at a consistent level. Coupled with this, the City needs to continue to press the other 2 levels of government to help pay for services particularly when some of the population growth is tied to immigration policy, and other levels downloading services to the Municipality. There is a finite limit to the amount that the City has available given the other things that a City must do to operate. So, in order to ensure that more funding is available year over year, the present annual increases in Property Tax increases must be maintained, and be coupled with a sincere audit of where the City may be spending money on other items. It may be a painful review process. Our Centre does not receive any funding from the City for its youth services. From all the community centres that are part of the Coalition and of which the Centre is a member, it is in the neighbourhoods served by the OCCRC that we find the largest number of teenagers between the ages of 15 and 17, or 13.4%, as opposed to 12.2% for the City of Ottawa overall (source: Statistics Canada, 2016). Since 2015, we have demonstrated just how innovative we can be in order to continue to meet the needs of our youth. For example, we successfully applied for non-recurring grants totalling more than $430,000 from other funding providers such as the Trillium Foundation of Ontario and the Ottawa Community Foundation. Unfortunately, these sources of funding will no longer be available to us in 2020. We also made optimal use of funds raised through a number of our own fundraising activities. Combined together, these funds have allowed us to offer services to hundreds of youth in need in our community. a. Should you be elected, would you commit to working with us so that new municipal investments are made to ensure the delivery of youth services in our community? b. In addition, how would you engage with youth and their families who come from marginalized communities, as well as with community organizations that support them to ensure that each youth has the opportunity to reach his or her full potential? a: Thank you for creating new programs for youth despite a lack of funding! Yes, I will work to explore more resources for youth programs and youth community development in Orléans. Persons aged 15 to 17 are at a crucial point in their development and require support, structure and the opportunity to develop necessary life skills and coping strategies. Strong intergenerational relationships and youth engagement is essential to a thriving community. There currently exists a gap of available services for that age group that needs to be addressed. b: It is important that our councillor develop effective communication with their residents. I plan to use all available platforms to communicate with residents to make it easy for them to find information on programs and events that might interest them. I would also collaborate with the organizations themselves as well as schools in the area as to what best practices exist to ensure that my methods of sharing information are adequate and are reaching the intended audience. a: I, would commit to working with you so that new municipal investments are made to ensure the delivery of youth services in our community. b: I would be a resource to connect community organizations that support them to ensure that each youth has the opportunity to reach his or her full potential. a : Oui, advenant mon élection, je m’engage à travailler avec vous afin que la ville investisse davantage dans la prestation de services aux jeunes dans notre communauté d’Orléans-Cumberland. b : L’inclusion pour tous est une question qui me touche particulièrement. J’ai été élevé par une mère monoparentale, ma sœur est atteinte d’une déficience intellectuelle et j’ai un oncle qui est atteint d’une maladie mentale. Je suis moi-même une personne à très faible revenu. Je ne possède pas de voiture : je dépends du système de transport en commun. Étant le plus jeune candidat à cette élection (25 ans), je suis naturellement porté à me soucier de l’inclusivité des jeunes de ma génération. Je m’engage à aller à la rencontrer des jeunes et de leurs familles marginalisées, advenant mon élection. Les organismes communautaires, comme le Centre de ressources communautaires Orléans-Cumberland jouent un rôle crucial pour s’assurer que chaque jeune à l’opportunité de se réaliser pleinement. Advenant mon élection, en plus de revendiquer de meilleurs fonds pour les organismes communautaires qui œuvrent dans le milieu, j’agirai en tant qu’ambassadeur de ces organismes : ils trouveront toujours une oreille attentive en moi. I believe in our youth and that we all have a responsibility to support them and remove barriers that may impede their future successes, dreams and unique contributions. I very much look forward to working with the OCCRC to see how the municipality can assist in mitigating any anticipated gaps in youth services as a result of decreased funding availability. I also support collaborations and partnerships, and under the right circumstances public – private partnerships. I would seek collaborations within our community that contribute to youth services, youth employment and youth engagement. I would continue to support local business incentives that target youth summer employment (such as the Summer Student Program offered by Invest Ottawa) where I have been a mentor for the last 3 years. In addition, I would advocate for business sponsored activities / cultural events that reflect and celebrate the diversity of our community. Music and the arts transcends all cultural boundaries and bring all members of our community together; the perfect opportunity to communicate with, engage, and support our youth. a: Yes, I believe we must have these programs to avoid further increases in petty crime. I am not saying I think all the petty crime we see in Orléans is by youth. I am saying if we don’t have programs for youth we will have increased petty crime. I am particularly concerned about immigrant youth who came to Canada after the age of 12 not speaking either English or French. The younger kids are at risk of losing their first language(s) via Canadian schooling. But these older kids are at a risk of never feeling like welcomed members of our society. Arts and sports program are one more way to integrate these kids into our community. b: One of my dreams is to have a maker space here in Orléans. I’d like to start with monthly repair workshops. I think upper and middle class folks who are committed to reducing waste are looking to do repairs but lack the know-how. I suspect folks and teens who grew up in war torn countries may have innovations / repair skills we haven’t taped into. I would like to see a maker space program provide a tangible link youth who drop out of traditional schooling see a way forward into trade programs in our community colleges. We need more tradespeople and these are good steady jobs which are less likely to be disrupted by technology than some other jobs. We may need to provide more language support to help newcomers get the language skills to succeed in these programs. They may also need microloans for start-up costs like basic tools and equipment. Additionally, I want to see more of our Orléans small businesses apply for federal funding for student employment support. For their parents, I wonder if we need a microgrant program. Some home businesses don’t take a lot of capital but are beyond the means of those living below the poverty line. a: Our youth are the future, I would love to work closely with the OCCRC. We know the investments will pay off in the long run. The City needs to make more decisions based on the future rather than short term gain. b: For starters I would treat them the way I want to be treated and I would sing and dance and eat with them. I would also like to learn as much about them as possible so I can best understand where they are coming from and properly address their needs. I would meet regularly with the community organizations. Youths need support we have to give them what they ask for. a: I will work with you to find ways to continue providing these essential services. b: I will always be a champion for your Centre. If I am elected, I will continue to canvass and listen. I would also like the Centre to have a representative on an advisory council that I will set up in order to ensure I am hearing diverse perspectives in our ward. I would also like to hear from your clients, especially your youth clients, periodically in the form of a councillor’s forum, but we can talk about that in December. What you do is incredibly important and I will work with you to serve those requiring extra help in our community. a : I will ensure that provincial guidelines are followed by the city and if there is a need to increase funding, I will ask for the assistance from the provincial government. We need to continue to ensure that there are enough funds for youth services. b : I will develop a close contact with Community organizations and pay visits to individual cases where it’s required. I will ensure a friendly and open communication among the youth. a: One of the items that I have , early in the campaign, stated is that the City must do an audit of the spending that goes to special interest groups, and associations throughout the City. I believe that funding decisions need to supported with tough “merit-based” review. I believe there are associations/groups that receive regular funding which do not really contribute to the betterment of the City and its citizens. I can think of a couple that I would question immediately. Again , there is a finite amount of money available , and we need to set the criteria for who should get funding and who should not. I believe working with Youth, in their formative years, provides the community with value and looks to help youth grow into good community people. So, Yes I would commit to “re-assigning” funds to groups that actually provide value for the community. b: Families that live in marginalized communities often get stuck in the cycle of poverty and idleness simply because they cannot afford to participate in Community centers and/or community activities. This cycle makes it difficult for youth to experience the value of true participation within the community to foster that community pride. I believe the afore-mentioned reviews of funding would allow the City the ability to create more, and meaningful programs for youth. The funding may also free up dollars to allow additional subsidies to low income families. I would also tap into the Volunteer community to help run and support these endeavours. Organizations such as the Orléans-Cumberland Community Resource Centre (OCCRC) are grateful for the annual base funding increases that they have received from the City of Ottawa for programs and services that they deliver on the City’s behalf. The Coalition of Community and Health Resource Centres (CHRC) plays a lead role in ensuring that newcomers are provided with the resources that they need in order to settle and become engaged in Canada. This was never more apparent than when the City of Ottawa welcomed several thousands of refugees from Syria in 2015-2016. As Canada continues to represent a safe haven to people who have fled violence and war in various countries around the world, both their numbers and the severity of their needs keep increasing as many people who arrive in Canada have suffered from loss and trauma tremendously. 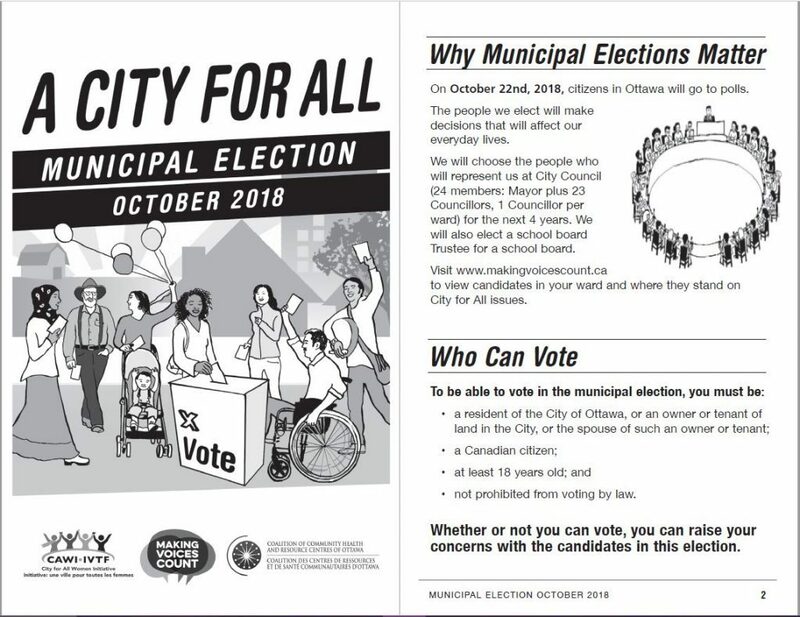 Should you be elected, how would you ensure that the help provided by the City of Ottawa to the community continues to be a welcoming place for people who have been displaced from their homelands as a result of often unimaginable circumstances? I have heard residents express concerns about the often difficult process of integration for refugees and immigrants. I believe that our city can do more to help newcomers’ access essential services, such as those offered by community resource centres. As councillor, I will serve as a link between new residents and the services they require. Also, I support Councillor McKenney’s motion from February 2017 that Ottawa be designated a sanctuary city. I am committed and will go get the Federal and Provincial help that we are entitled to ensure that the community continues to be a welcoming place for people who have been displaced from their homelands as a result of often unimaginable circumstances. La ville d’Ottawa doit être un chef de file en matière d’aide aux personnes qui ont été expatriées dans de très difficiles circonstances. On a qu’à penser à l’aide que la Ville d’Ottawa a apporté dans les années 1970 dans le cadre du « Projet 4000 », venant en aide aux réfugié.e.s de la mer d’Asie du Sud-Est (communément appelés « Boat People »), alors que Marion Dewar était à la tête de la municipalité. Our community has a strong and proud history of welcoming and helping those in our world who are forced to flee from situations beyond our comprehension. The diversity of our current community is a testament to this fact – but we also share this responsibility with other levels of government that need to keep pace with the demands on the system. I will work with city council, federal / provincial funders and community organizations to seek a more responsive and equitable system that will allow us to continue to be a welcoming place for newcomers, but also ensuring the initial cost burdens are shared equitably amongst the municipal, provincial and federal governments. I have addressed this question in my responses about youth services and social infrastructure. I will encourage The City to introduce a peer support program. I would try to match current residents that have successfully navigated the “New to Canada” system with new residents looking for support. I would also like to increase our education services for new residents. As a veteran of the war in Afghanistan, I have seen this devastation first hand. For me, it is not unimaginable. I have lived it. I want Ottawa to be a safe place for anyone genuinely seeking refuge from war and destruction. Our immigrants and refugees are incredibly hardworking and make major contributions to our community. We must continue to welcome them and to help them find their place in our community. Inclusion is the key to building resilient communities. I will work alongside the existing programs which are in place by the city and will work to increase support as need arises to provide the community and keep it welcoming. I certainly would support this valuable and humane program, it’s what makes Canada great. There are many church and community groups that, along with the City and other government levels, that have welcomed immigrants over the past few years. I believe that there clearly needs to be more integration of those services so that we can ensure an efficient and lasting process evolves. I think, again, funding is a key issue along with affordable housing and integration support, be that language training, cultural orientation etc. I like to think that all three levels of government have a shared intent to welcome those from dangerous situations into Canada and our city, therefore I think funding needs to allocated to City, perhaps on a per capita basis, to allow the level of government most closely aligned to day to day living, The Cities, to fulfill the needs of immigrants and to help them become contributing members of the city. Canada is in the midst of an overdose emergency, with people becoming ill and dying from drug-related causes at an unprecedented rate. The OCCRC is one of many community and resource centres that work with partners such as community health centres, Ottawa Public Health, Ottawa Police Service, Ottawa Fire Services, Ottawa Paramedic Service and medical professionals to ensure the safety of drug users. a. Please share your harm-reduction perspectives as a key part of the solution for prohibition and drug poisoning related harm and death. b. Should you be elected, how would you ensure that the City of Ottawa continues to invest in services that will reduce risks while easing the burden caused by drug overdose that falls on people, families and our community? a: Countless studies show that a harm-reduction approach has many more positive outcomes than a punitive or reactive one. Harm-reduction methods also allow us to help people in a more compassion, considerate way; they leave space for a person to make choices, to participate in the process and to have dignity. In our ward, the landscape of drug use is different from that of downtown. Drug users are generally housed, meaning that their use is not done publicly, but rather behind closed doors. This sets up vulnerable people to be isolated and disconnected from life-saving supports. People who use drugs, who happen to live in our ward, deserve better outreach services, as they are just as exposed to the risks of drug criminalisation, prohibition and a poisoned drug supply. b: The city needs to support the work done by harm-reduction staff, peer frontline workers and public health workers, who are telling us that supervised consumption sites are necessary and life-saving, including the city’s own Medical Officer of Health. This is a complex issue and I would like to see more resources in rehabilitation, education and prevention. a : La sensibilisation et la prévention sont pour moi capitales en matière de réduction des méfaits. Nous – les élus et organismes communautaires – doivent travailler en amont afin de réduire le taux de criminalisation et d’empoisonnement des drogues lors d’épidémie de surdoses mortelles. b : Advenant mon élection, il est important pour moi que la Ville d’Ottawa investisse dans la prévention et continue de venir en aide aux individus aux prises avec des problèmes de consommations. D’ailleurs, je me suis déjà prononcé publiquement en faveur des sites d’injonctions supervisés. La santé publique et le bien-être doit nous préoccuper tous. Le poids des surdoses ne doit pas retomber uniquement sur les épaules des individus et de leurs familles. Je vais m’assurer, advenant mon élection que les individus aux prises avec des problèmes de consommation et les organismes communautaires qui leur viennent en aide recevront l’appui qu’ils ont de besoin. 4a: It is absolutely critical to understand the challenges faced by people who use drugs and the need to take a compassionate approach to harm-reduction. 4b: Support existing programs and services; collaborate with other Councillors, city officials and service providers to reduce the risks while finding ways, in consultation with others, to deal with the burden that often falls on people, families and our community. Public health authorities support harm reduction interventions as they are proven to work, are good value for the money invested and improve health outcomes for not only the addicted but the broader community as well. If we remove the stigma of addiction and treated it purely as a chronic disease, it would receive the same health and social services other chronic diseases receive … and without debate. Although scaling up harm reduction strategies requires an investment, it is worthwhile not only for the societal benefits, but also for the significant returns on investment for governments in terms of the potential savings in overall healthcare, social and judicial program savings costs. If elected, I would continue to support our public health, police, fire and paramedic experts in harm reduction activities that are targeted at minimizing the devastating effects of this important issue. I actively support best practices in harm reduction initiatives and I consider the illegal production and / or distribution of these drugs to be an extremely serious crime requiring equally serious consequences. I also endorse an investment of resources to alleviate the impact the opioid crisis is having on family members within our community who are the ones often suffering in isolation and wondering where they can go for support. a: My perspective is that addiction can be beaten but death can not. I support harm reduction program even if the city must fund them directly (because the province has failed to do so). b: I support SIS as part of a program to support current and former drug users. I want see programs like the opioid managed withdrawal programs. But this is a complex multi-partner, multi-government issue. I will be lobbying for the city to be an active partner is addressing the problems. Allowing people to die is not an option. We must go out of our way to prevent these preventable deaths. I believe in supervised injection sites however this is really just the first step, we must do much more. I believe we need to invest in state of the art treatment homes where someone can go for a period of time. The homes would promote healthy living and a substance free lifestyle. The person would have to agree that they will remain in care for a specified period of time. They would receive regular support and would be actively engaged in recreation and all the beautiful things life has to offer. I like the idea behind 1000 Islands addiction rehab centre however I’m not sure what their intentions are and apparently it’s quite expensive. If we had something similar where the only objective is to help with recovery and support, I think it would really make a difference. A housing first approach will also help many addicts with recovery. a. I support Safe-Injection sites. The literature is clear, SIS reduce harm. We must couple SIS with proper drug and social counselling in order to increase the chances of a return to sobriety for drug-users. Drug use is often a symptom of a deeper mental health issue. Let’s work together to heal the root issue while also tackling the symptoms. b. I will support SIS as well as increased funding for mental health. We cannot be our best if we do not feel our best. a : My harm-reduction perspectives would be to create more awareness and education towards these issues as well as more help to people that may require it. b : I will work to ensure that the professional help that is needed is easily accessible to affected individuals and their families. To accomplish this I will promote having open discussions with families involved through front line doctors and volunteers. a: Is Prevention, some of the work done with youth in danger appears to be making a difference in leading young people from becoming involved in drugs in the first place. Some of these strategies have been discussed above in terms of community programs and activities for youth involvement. These programs can provide direction and self-pride for our young people. A part B of this is the identification and treatment of mental health issues, particularly with youth. We need, as a society, to ensure we have “timely” treatment for those in need. Expansion in the Prevention will certainly lessen the problem. The second level of action pertains to those who presently find themselves in the grips of addiction, and need help, support and direction for rehabilitation. I do believe that homelessness, mental health issues, and a general sense of hopelessness has led many to an addiction to drugs. I believe we need to actively present rehabilitation services to these folks , that includes the offer meaningful living alternatives. Easily said, not easily done! Some things that may enhance rehab efforts could be a program that offers job placements that would instill a sense of pride for those work to rehab. b: Ithink that the City should continue to make services available, however to garner more complete public support, we must try to control the expansion of SIS locations in residential neighbours. I, like many, have expressed the concerns about SIS, while acknowledging that the do save lives. Perhaps Mobile SIS units could be the answer. Or given the life-saving, and medical urgency of the situations, they may be best located in or near hospitals. Having said that I do agree with programs and services for those in need, but I think careful control and monitoring is also needed. Overall shelter use in Ottawa increased by 16% from 2014-2017, and it is primarily the result of a rise in the number of families and newcomers. Single women represent up to 21% of all shelter users in Ottawa who are single. Homeless people in our community who have no other option but to live in their car, come to the Centre every day to use our showers and to receive a range of services that they need. It is obvious that there is not enough affordable housing in Ottawa to meet the demand. In 2017, more than 10,000 people were on a centralized waiting list for social housing. National trends indicate that housing costs are significantly higher in locations near rapid transit systems. High rent costs put many individuals at risk of becoming homeless or of having to live in sub-standard conditions. a. Should you be elected, how would you ensure that the City’s plan to reduce homelessness includes specific measures and goals, and with sufficient funds allocated to them to bring about this reduction? b. Would you ensure that 25% of new housing developments are dedicated to affordable housing with a special emphasis on very affordable housing located within 1 km of rapid transit stations in our City? a: The city needs to invest, with planning and with funds, in a more substantial approach to reduce homelessness. The progress report on the 10-year Housing and Homelessness plan shows us that we are not adequately addressing the issue. I agree with Alliance to End Homelessness Ottawa that we need to prioritize prevention and address systemic barriers, as well as dedicate more capital to this priority. 5b: Yes, I wholeheartedly support the implementation of this policy. The extension of the LRT into Orléans is a perfect opportunity to build on this policy and create more affordable housing in our community. There is land yet to be developed around the future LRT stations that is ideal for this purpose. a: I would commit to see a plan by the city to reduce homelessness witch includes specific measures and goals, and with sufficient funds allocated to them to bring about this reduction. b: I believe that 10 000 families on the waiting list is to long. I commit to ensure that 25% of new housing developments are dedicated to affordable housing with a special emphasis on very affordable housing located within 1 km of rapid transit stations in our City. a : Advenant mon élection, je m’engage à m’assurer que le plan de la Ville d’Ottawa à réduire le nombre de sans-abri inclura des mesures et des objectifs précis et qu’à chaque budget, un montant soit prévu à cet effet, afin d’en réaliser la réduction. b : Oui, je suis entièrement en accord que 25% des nouveaux projets domiciliaires vont être consacrés à des unités de logements abordables. La densité et la mobilité urbaine sont pour moi prioritaires. 5 b: I am committed to address the shortage of affordable housing in Ottawa and come up with workable solutions. The statistics cited in your question are simple to understand numbers behind some very complicated social and administrative issues that span many sectors in both the public and private realms. The City’s plan to reduce homelessness should at minimum provide specific outcome measurements in occupancy and waitlist levels at city shelters, food banks, acute mental health and emergency community service utilization levels, unemployment rates and social housing waitlists. Funding should be allocated to the department / agency most responsible for meeting the desired outcomes in the City’s plan. I support the goal of ensuring a percentage of new housing developments be dedicated to affordable housing and agree with the notion that affordable housing be located within close proximity of rapid transit stations but suggest exact percentages be determined only after proper consultation occur with the community each councillor is representing. Blanket statements may not reflect the requirements and diversity of each community that makes up the City of Ottawa. What may work in one part of the city may not be feasible in another. a: I support the Housing First approach. I think supporting people into housing is cheaper than addressing their needs once they are homeless. I would add programs to support emergency payments directly to landlords to prevent evictions. It is shameful that people can access more help once they are homeless than they can get to prevent becoming homeless. Additionally, I think we need to learn some hard lessons from the Herongate demovictions. We need to play a role in addressing problem landlords. Tenants do not have the time or tools to advocate all on their own. They need council and city champions on their side. b: I support a 20% target for all new development with a 30% target in transit oriented development zones. Additionally, I would make targets for accessible and large family units within the affordable housing targets. Perhaps of the 20%, 20% must be accessible and 30% must be 3 bedrooms or more. a. All 3 levels of government need to smarten up! I know this is a complex situation and it’s related to developers, big business and banks. Hence the importance of progressive politicians who have the courage to take us in another direction. We need to switch to a housing first approach. I will meet with all the experts, bring them together, create a plan and take action. There’s an amazing place at 1900 St. Joseph Boulevard that I believe is proof that housing first works. The money needs to go to housing first. I have a big mouth and I will not stop until the funds are in place. If all of council comes together on this issue we should be able to get the whips out on the other levels of Government. b: Yes, I would be looking for 30% and I will also like to make certain this includes rental properties. a. Goals and targets are required to measure programme effectiveness. I’ll work to create and pursue hard targets for affordable housing and a reduction in homelessness. b. Yes, 20-25% of new housing must be affordable and must be close to city transit. a: I would ensure that the city’s plan to reduce homelessness would be taken seriously by introducing a subcommittee to reduce this issue. b : I would like to maintain that 25% of new housing developments are dedicated towards affordable housing. a: I believe that any program that has specific outcome in mind must be support by reasonable and achievable goals and “measureable” data that can show that the action plan is having an impact on, and moving toward, the stated outcome. Programs without these elements are doomed to failure, while allowing those running the programs to claim that they are doing something. Vague goals like” eliminating poverty” sound nice but there needs to be some incremental goals to move toward the outcome. Poverty and homelessness have a variety of underlying reasons and the same actions for each seems to be at fault. We need specific, focused plans to address the various facets of the problem, and we need to fund these actions to reaching these specific goal. Funding a vague goal, I believe, is doomed to continued failure. b: I am a strong supporter of the concept of Inclusionary Housing, which promotes the allocation of a % of housing developments to “below market value” units to promote affordable housing. I think that 25% should be a long-term goal, but perhaps we should start with a lower percentage and grow toward the 25%. Even “below market units” are sometimes out of reach for disadvantaged families and individuals, I would like to see below market units made available to appropriate organizations and business with the aim of providing affordable rental housing also. Following a well-attended community conversation in response to concerns around swarmings and the subsequent arrest of three young men. Resident leadership led to a Facebook group called “It’s Your City, Let’s All Help Make Orléans Safe” which quickly gathered over 4,500 residents to discuss these issues. Unfortunately, young people, specifically young men, have not been at the centre of these important discussions. Should you be elected, how would you ensure that responses to concerns expressed at community events are evidence-informed, and that they do not lead to further marginalization and isolation of vulnerable communities? How would you ensure that all community members feel safe and have a sense of belonging, regardless of their age, faith or ethnicity? It is important that our Councillor communicate effectively with residents, and involving community resource centres and other community organizations in conversations such as this one is a big part of that. I attended the meeting on August 8th, and was surprised to see that only one person representing a school was present. A community development agent was present, but was not invited to address the crowd. It is difficult to balance the fear and worry of some residents with all residents’ need to feel safe. We need to ensure that all community members are invited to participate and that all leaders are aware of the impact their words have on our community. I commit to ensure the restoration of the neighbourhood watch program. In order to free the police to do there jobs I would create a new special constable. L’inclusivité de tous et toutes et sous toutes ses formes est pour moi primordial. En cette époque de chamboulement et d’incertitude, il est important de réagir aux enjeux de façon songée et réfléchie. Mes décisions seront toujours effectuées en fonction de l’intérêt général et j’aurai toujours une sensibilité particulière pour les personnes en situation de marginalisation, d’isolation et de vulnérabilité. Ayant une scolarité de maîtrise et un baccalauréat universitaire en sciences sociales, je connais l’importance de faire ses devoirs et de bien s’informer en lisant les rapports, études et statistiques. Chacun et chacune doit se sentir en sécurité à Orléans-Cumberland. Cela va de soi. Les solutions qui seront proposées doivent aussi répondre aux besoins des communautés vulnérables. I will support evidence-based initiatives that minimise the risk of blowing an issue out of proportion. If an issue is limited and not generalised within the ward, I will make sure we are not perpetuating the problem while taking the necessary time to talk about and steps to make sure we identify possible solutions. I will continue to engage youth and ensure that there are available and affordable programs and services for them as well as continue to work in concert with key organisations and service providers. I was actually at that meeting on August 8, 2018 at the Ray Friel Centre! It was a great opportunity to hear some of the many concerns of the public, as well as elected officials, the Police and Neighborhood Watch. Mis-information continues to get the time it does not deserve. It is imperative that communication to the public is provided in a timely manner for all issues. There was serious concern at the “It’s Your City, Let’s All Help Make Orléans Safe” meeting that parents may have contemplated taking matters into their own hands in the form of street patrols. This cannot be allowed to happen. Social media is a great avenue to voice awareness, share knowledge and gather opinions, but official channels such as reporting to the Police is required. Proper reporting is needed so that decisions can be analyzed and a coordinated and planned response/action provided. Safety in our communities is a basic human need. Crime has many victims – but we can’t let crime polarize our community and detract from the fact that Orléans is one of the most livable, unique communities in Ottawa and Ontario. Should I be elected, my focus and energy will be examining the underlying issues and working with the OCCRC and other organizations to ensure available services continue to grow to meet the needs of our youth, particularly those marginalized. As an active community leader (and elected representative), I will continue to attend and support as many community events as possible either in-person, or helping to cross-promote on social media. Spreading the word about events, activities and initiatives creates a sense of belonging within, and throughout, the community. Orléans is an amazing community composed of people from every age, faith and ethnicity. One of the pillars of my platform is believing in the power of working together. Connectivity and collaboration among various groups is key. Yes, I am worried than most of the complaints which have specific details do seem to have racial or agist overtones. I am also wondering if some of the reports are false to stir up trouble. Some of the accounts reporting issue seem to have a very short Facebook history before the posting. I have been very impressed by the Youth In Policing Initiative. I would like to engage them in reaching out to young people in the area. I’d also like to create a youth council for the ward. My understanding if the Gatineau council has a youth council which includes 2 reps from every high school. I’d like to adopt a similar model here in Ward 1. My main question is should this build on the existing council MPP Lalonde has or be a separate program. Unfortunately people have the right to say or think what they wish. There’s good and bad with this. However aware community members need to get together and speak up! We have to fight back, find our supporters and speak louder than the ill-informed. I hate to be repetitive but the only way all community members are going to feel safe and have a sense of belonging is if we all come together. We need to sing, dance, eat together and live together. 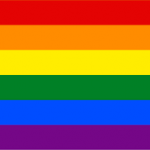 Everyone deserves to live in an inclusive and safe community. Following that meeting, I spent an entire shift with an OPS officer in his cruiser and got to see our community form their perspective, first-hand. I will continue to work with our officers and service to promote a community-based approach to policing. We must continue to build trust, foster cultural understanding and build our community together. I recently attended the open house meeting related to the swarmings and once again I am saying that we need to have more bright lights around parks, playgrounds, walkways and increase random police patrolling. Orleans is a very multicultural place and everybody belongs here, we need to work together to keep our community members safe and have a sense of belonging. I attended the session at the Ray Friel Center, and was impressed by the Community Police officers in attendance for raising the point that simply posting to Facebook is not an effective way to resolve a problem. They actually indicated that “reported” incidents were in fact down from the previous year. It was an eye-opener for all. I was very concerned with some comments on FB that promoted vigilanty actions by neighbours. Let’s leave enforcement to the professionals. Enforcement is certainly usually based on facts and evidence, but there is a need to also look at root causes. Some of the things noted in earlier questions like community youth involvement, and programs to bring idle youth into sports and other activities would certainly help. I believe that responsible leaders must stand up to the promoters and/or defenders of racist behaviors. We must also continually promote Canadian values of equality and diversity for all. Simply letting racism to quietly fester allows it to prosper. View important document about municipal elections!